Krista practices occupational therapy at UW Health. 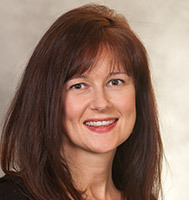 She is a Certified Hand Therapist, specializing in treatment of patients with hand-to-shoulder orthopedic conditions. She has a special interest in pediatrics, cancer rehabilitation and pain management. She is also a Certified Lymphedema Therapist, a member of the Lymphedema and Venous Edema team and a member of the UW Health Performing Arts Medicine Clinic. Krista sees patients upon referral from all medical providers. Krista holds a Bachelor of Science degree from UW-Milwaukee.